Back in 1990, when we began our NSA distributorship that eventually morphed into the JP+ Virtual Franchise we love today, I was ‘clueless’! I was not teachable, I reinvented the wheel, my people skills were appalling (really! ), I didn’t know what I was good at (my abilities and strengths) and I lacked passion. My sponsor once told me “If you could ever get as passionate about this business as you are about soccer, there would be no holding you back.” He was right! Then three things happened: I was humbled by my lack of success in this business (for 3 years), I began to understand myself better (especially my strengths and weaknesses), and I developed a passion. Not only was my passion for Juice Plus+, but also for helping people to regain their health, gain financial peace, and (above all) to discover themselves and grow, just as I had. More recently I’ve ready several books that clarified the process I’d seen in myself and others, and that offered ways to accelerate the process. These books explained that where our Strengths (abilities, talents and gifts – the things we do well) intersect with our Passions (the things we love to do) intersect, that is our Sweet Spot (aka “the zone”), where everything just feels right. Reading the Radical Leap by Steve Farber, I learned years ago that the ‘sweet spot’ is where you “Do what you love, in the service of others, who love what you do.” This was life-transforming for me and the many others who made this one of the best 100 business books of all time. It’s such a simple concept, but like so many others, those that are simple are usually the most powerful. When we do what we love, we also do what we are good at; when we do what we are best at, we have the most fun – we love it, and our passion for life overflows. When we are in that ‘zone’ other people love to watch us. Just think YoYo Ma, Michael Johnson, Tiger Woods (at his former best! ), David Beckham – watching those and other brilliant men and women performing at their highest level is breathtaking. I wish I could have seen Mother Teresa in action. Who comes to mind for you? When we do what we love, that we do best in the service of others … that’s when miracles happen. When we operate in our sweet spot serving others, they love it! That represents our purpose in life –every one of us. Then we are living life on purpose. As a result of discovering my Sweet Spot, I was able to craft a mission statement (reflecting my life purpose – the reason for my being): “I encourage others to their full potential … in health, in wealth, in service, in character and in eternity.” . So, what about you? 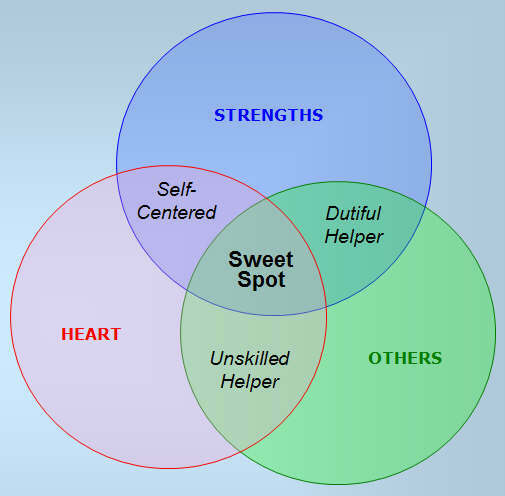 How can you discover your ‘Sweet Spot’? What are you best at? What do you love to do? How can you best serve others? Where could this fit in your Virtual Franchise? First, discover your Abilities and Strengths. Next understand your Heart. Ask close, trusted, wise friends and family members to tell you what they see in you. Next, look at your inventory, list all those things that sit in the intersection of your abilities, your strengths and your heart; now see how they fit with your Virtual Franchise. Finally, figure out how to spend 80% of your time doing those things that fit inside your Sweet Spot. Live there; operate there; and love it!